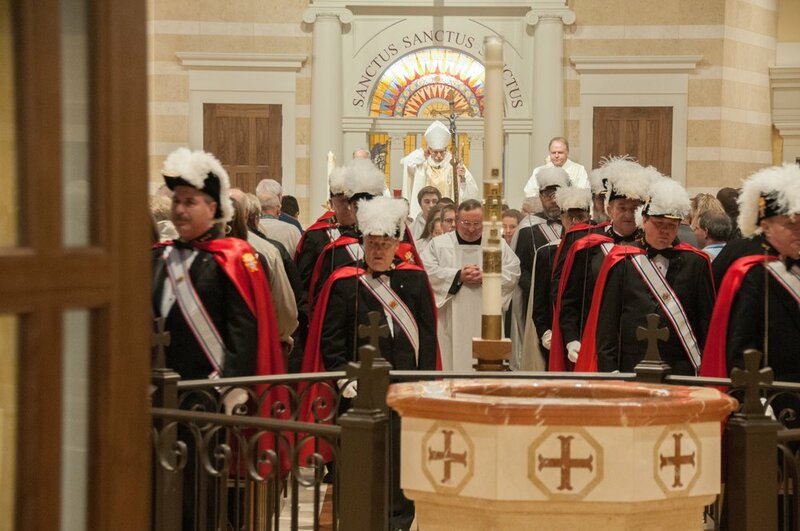 The Knights of Columbus is the world’s largest Catholic fraternal benefit society, with more than 1.9 million members in over a dozen countries. Founded by Father Michael J. McGivney to help provide financial aid to Catholic families, the Knights of Columbus is now one of the largest life insurers in North America. The Knights of Columbus also helps support a multitude of charitable causes; in the last decade, the Order has given more than $1.55 billion to charity. Membership in the Knights of Columbus is open to men 18 years of age or older who are practical (that is, practicing) Catholics in union with the Holy See. A practical Catholic accepts the teaching authority of the Catholic Church on matters of faith and morals, aspires to live in accord with the precepts of the Catholic Church, and is in good standing in the Catholic Church. You can begin the membership process for The Knights of Columbus Chapter 11187 by picking up a pamphlet in the Seton Welcome Center or emailing us to get started. Members meet on the second Wednesday of the month in classrooms 7 and 9. The time commitment is flexible as we understand that members have work and family obligations. As a Knight you can choose the projects that you want to become involved with within your own community. The Order is also dedicated to family life and the many benefits it offers. From life insurance to scholarships to service programs and social activities, all are open to the whole family. Charity – Our Catholic faith teaches us to “Love thy neighbor as thyself.” Members of the Knights of Columbus show love for their neighbors by conducting food drives and donating the food to local soup kitchens and food pantries, by volunteering at Special Olympics, and by supporting, both spiritually and materially, mothers who choose life for their babies. Knights recognize that our mission and our faith in God compels us to action. There is no better way to experience love and compassion than by helping those in need, a call we answer every day. Unity – None of us is as good as all of us. Members of the Knights of Columbus all know that together we can accomplish far more than any of us could individually. So, we stick together and support each another. That doesn’t mean that we always agree or that there is never a difference of opinion. It does mean that as a Knight of Columbus you can count on the support and encouragement of your brother Knights as you work to make life better in your parish and community. Fraternity – Venerable Michael J. McGivney founded the Knights of Columbus, in large part, to provide assistance to the widows and children left behind when the family breadwinner died – often prematurely. The Order’s top-rated insurance program continues to do this today, as do the good works of individual Knights, who gave more than 73.5 million service hours in 2015, illustrating how Catholics serve each other in fraternity and mercy. Patriotism – Members of the Knights of Columbus, be they Americans, Canadians, Mexicans, Cubans, Filipinos, Poles, or Dominicans, are patriotic citizens. We are proud of our devotion to God and country and believe in standing up for both. Whether it is in public or private, the Knights remind the world that Catholics support their nations and are amongst the greatest citizens. If you would like to join or have further questions about the Knights of Columbus Council 11187, please click the button below. Are you interested in other stewardship ministry opportunities at Seton?